Shopify entrepreneurs all have one thing in common: they need to sell more. That's why we are building sales apps that boost conversion and sales. Enable customers to get a discount automatically if they come from a discount link or if they buy more than $X. Upsell customers on the product, cart, thank you page, inside the theme, a popup or a notification. Create limitless promotions that stack discounts in your Shopify store. Grab customers' attention as they leave your store with discount popups and turn an exit into a sale. 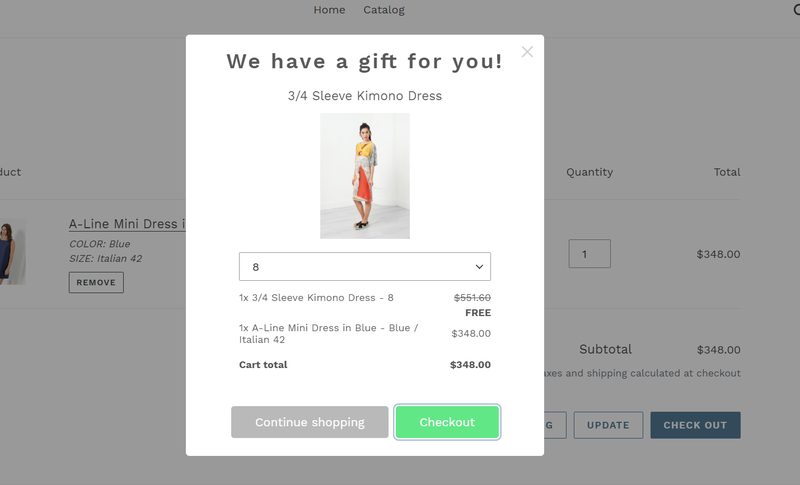 Add a coupon field in the cart of your shopify theme and allow customers to enter a discount before the checkout page. Found a bug and Tabarnapp gave me an awesome customer service. It's working all fine now and I'm sure he is dedicated improving and making this app Great. I appreciate this app as I was looking for a way to give my Canadian customers an automatic discount to help counter the low value of the Canadian dollar. Derek responds quickly to questions. Just what I needed! We have some very specific rules that are a pain to handle manually and Automatic Discount takes care of them seamlessly. Thanks! And their support is top-notch. Good sense of humor, too! This app does exactly what it says it will without taking our time to futz with the theme itself, which is great! Great. Using it mainly for automatic discount links and so far it has been flawless. Thanks! Amazing, works right away and simple. Love simple. This app is great. It is annoying to only see the discount at checkout, but this is probably Shopify's limitation. Did exactly what it said it would!!! Pretty much the only app I could find that would do quantity discounts well without a crazy amount of install code. We have use this app for our holiday sales and it is working just like it said it would! Thank you. I was a little stressed as many of the more complicated apps say they will do something then it takes me more time to research and watch videos to figure out how to use it. This app is simple and straight forward. A much expected feature! This app allowed us to set up automatic discounts easily, and improve the customer purchase experience. Let's not forget the top-notch support provided by Derek! Shopify entrepreneurs all need help building their store. That's why we are building flexible themes that ease their life and shrink the gap between building the store and making some sales. I used Tabarnapp to get some changes made on my homepage. They went above and beyond to get it looking just the way I wanted. They were fun to work with and super responsive (even on the weekends). I'm definitely coming back to these guys. Tabarnapp has been fantastic. They've gone above and beyond. We will be working with them on all our Shopify needs. Superb. Patient, highly professional and went above and beyond of what was asked of him to get the job done right. I am very pleased with the high level of quality of the completed tasks, and i can't wait to hire them again for future work on my site. Great service, very helpful and professional! Helped us create a custom popup for our store in a timely fashion. Tabarnapp was great! very quick and I was able get my Pre-order button up and going within minutes. I will definitely recommend . Tabarnapp is attentive to the customer and very well structured in the realization of mandates. All steps are well documented. Very satisfied! We ❤️️ Our Clients. Be one of them 💕. Our mission is to build sales apps that Shopify should have built in their core to be even more flexible and powerful. All the apps we build have one goal: bringing high ROI for cheap. Designing a Shopify store is easy, it's a matter of installing a theme. If you want to make some changes to the theme or build a new custom one, that's another story! That's why we are there for you. Shopify is pretty easy to work with to build an online store. But our experience tells us it can become tricky really soon. That's why we help you build your store from A to Z. Check out our store packages. Sometimes you just need a quick help or support to build of fix something related to your Shopify store. We are there to help and offer bank of hours or a pay-per-task package. Find out more. We build Shopify stores, apps and themes that are designed to boost your sales. While other ecommerce agencies focus on everything and anything, we focus on Shopify and more precisely on turning Shopify stores into sales machines. Tabarnapp's mission is to help you get the most of each visit on your Shopify store.